The Fashionable Bureaucrat: Hipster or Hip? I subscribe to a number of websites that sell designer clothing and shoes "off season". Sometimes the temptation to buy stuff is strong but I've been very good lately about resisting. Until I saw this dress on MYHABIT. It sells for $245 on Modcloth - I got it for $89! I like the print but I also like the style of the dress. I'm quite pleased with my bargain purchase! The frames aren't white, more of a creamy colour, which was a surprise but that's no big deal. After I took these photos I realized that I should have been wearing my glasses. Next time! And holy crap, I'm wearing the same boots today that I wore yesterday! What's wrong with me? I think it's really that I wanted the added warmth. Plus they are the best boots in the world. I have no weekend plans but I'm happy to see the back end of this week. I hope everyone has a great first weekend of 2013. But when you wear the same boots 2 days in a row you make me feel better about doing this! 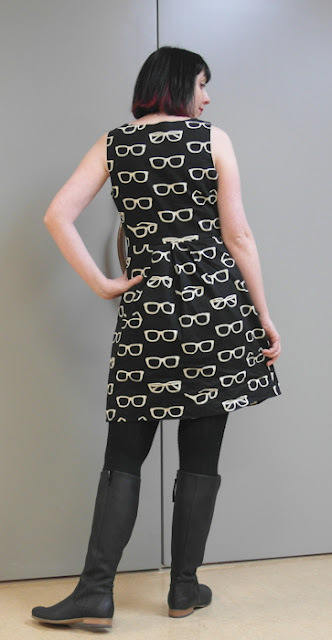 Love that dress - do you have pale/white framed glasses to match? That is a bargain! I have heard good things about MYHABIT but I haven't checked it out yet. Might have to look into it. The dress looks great, I can see why you had to have it! And wearing the best boots in the world two days in a row can't be wrong, can it? Very fun dress! And glad you got it at a low price. 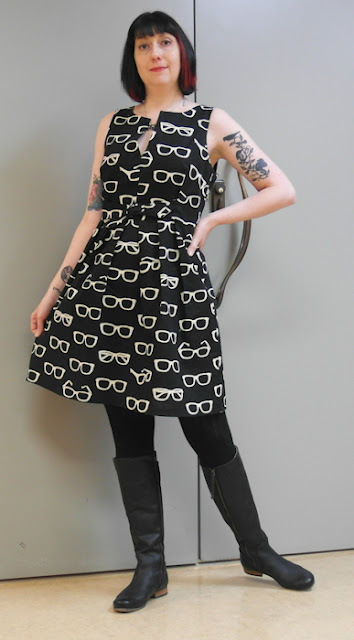 I often see stuff on Modcloth that I later see some where else for a lot cheaper. Kind of disappointing in my opinion - especially since many of the same companies ship to F21. My favorite place for browsing is TheOutnet, just to oogle the new pretty stuff that comes in! It's adorable on you! I like the variations in the glasses-print, and I'm glad you're enjoying the heck out of your new boots. I like My Habit in particular as a (mostly!) spectator sport because it's quick to have a peek at and often interesting rather than loads and loads of crud. Love the dress - the print and the style! I wanted to find something with a sunglasses print a few years ago, and never did. I'll have to check out those websites. Wow, what a cool pattern on that dress! I love the shape of the dress as well. I would be totally tempted to colour in one or two of the glasses (maybe one red and one turquoise) just to have a little pop of colour. And hey, when you have great boots, you gotta wear them! Hope you're having a fun weekend, Megan! I love the shape and the print on that dress. I've never looked at MYHABIT but now I'll have to take a look. I would wear those boots all the time!